I'm still reeling from a culinary experience from our recent North Carolina trip: boiled peanuts. Or "burled peanuts" as we started calling them on our drive home. I don't know what came over me. We were in peanut country, we saw homemade signs advertising them every few miles on the road, and I guess I got carried away. I wanted to try boiled peanuts. But instead of a total loss, these burled peanuts became the seed of an idea for a new (albeit hopefully infrequent) series: foods you only need to try once. I'll try them, and with any luck, I can spare you from the experience. At first they looked harmless, just a can full of peanuts soaking in brine. How bad could they be? Well, let's just say at least they weren't terrible. 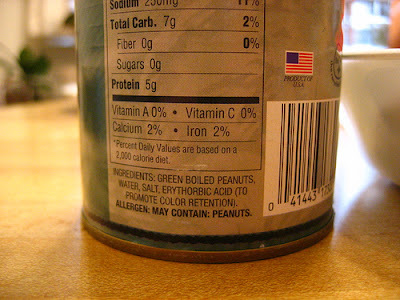 Boiled peanuts are like regular peanuts in the sense that you still have to remove the shell. But you can't really "crack" open the shell like you would a dry peanut. It's too waterlogged from sitting in a can of brine. Instead, you more or less smoosh open the shell. Unfortunately, in my first attempt, I smooshed open the shell a bit too vigorously, and I reduced the poor peanut inside to mush between my fingers. This was not a good sign texture-wise, I thought to myself. And, unfortunately, I was absolutely correct about the texture of the peanuts. They were mushier than mooshy beans. The experience was like eating a salty, wet, peanut paste. I'm slightly more concerned, however, with identifying erythorbic acid. I wonder, is it at all like sodium hexametaphosphate? Like I said, I tried 'em so you don't have to. 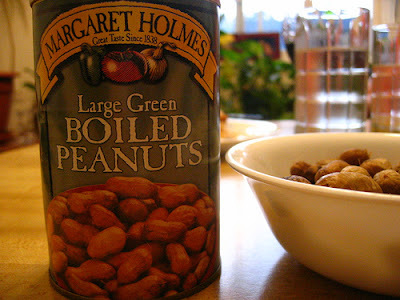 Boiled peanuts in a can??? Hi Phyllis and Janet, thank you for your comments! there's not much that comes in a can that's any good. 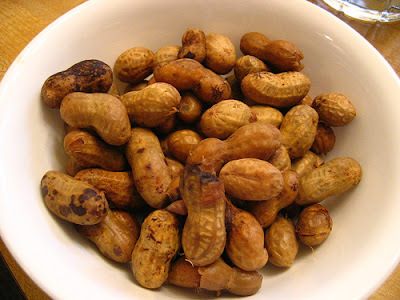 I've only lived in the south where peanuts grow for about three years now and here is the scoop on boiled peanuts. Boiled peanuts are best hot from the brine at the roadstand and eaten while warm. You need to aquire a taste for them, as the first time I tried them they were a little mushy for my taste. The first time I aquired some that were a little saltier than the others I had aquired were much better. If possible ask if you might taste one before purchasing. Some places will let you have a boiled peanut to sample. Okay, I'm now resolved. I'm going to try these guys again to see if I can "acquire" taste for 'em. We're heading down south for a visit to South Carolina in September, so I'll have my chances. First roadstand I see. You've got to try them so love them and some like this poster don't. But don't be close minded try them fresh! Where can you find these fresh peanuts in Sacramento? I am looking for some here.